Australian residents are going to be amongst the first in the world to install the revolutionary Tesla Powerwall thanks to an agreement between Tesla Energy and Infinite Energy. Tesla Powerwall is a wall mounted home battery that can be used to store excess solar production, allowing you to power your home in the evening with solar energy. Powerwall can store up to 6.4kWh of electricity which should be sufficient to meet the needs of most households’ evening demand. Energy arbitrage (charging Powerwall at off-peak rates and using the energy at peak times). Peak shaving (using Powerwall to reduce your peak demand – this will become common if networks operators start to impose maximum demand based charges). Backup in times for power outage. Infinite Energy will be selling the ‘daily’ Tesla Powerwall which is designed & warranted to charge and discharge on a daily basis which can be installed to backup loads. 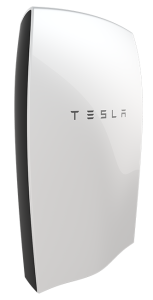 Unlike most batteries, Tesla Powerwall can discharge 100% of the energy stored within it. The battery, which comprises of the same lithium ion technology that is used in Tesla’s electric vehicles, is completely automated, easy to install and requires no maintenance. Telsa Powerwall is paired with one of Infinite Energy’s compatible solar PV systems. Excess solar production will be stored by Powerwall, ready to be used at night when the solar panels are no longer generating electricity. Powerwall enables you to better utilise your solar production, rather than exporting it to the grid for a low value. Initially, Infinite Energy will be pairing Powerwall with the Solar Edge inverter for homes with a single phase power supply and the Fronius Symo Hybrid for homes with a three phase power supply. Compatibility Single phase and three phase utility grid compatible. Installation Requires installation by a trained electrician. DC-AC inverter not included. Infinite Energy is currently taking orders for Powerwall. To register your interest, please click here.